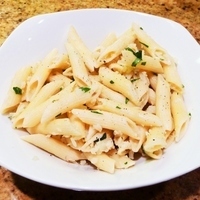 This is a wonderful, mild flavored pasta we've adapted from Marcella Hazan. I know it sounds like an odd combination of ingredients, but you should definitely try it. It's unlike any pasta you have likely eaten before, and it is quite tasty. We will definitely make it again. Serve with the roasted broccoli below for a nice combination of flavors and a healthy meal. Strip the cauliflower of all its leaves except for the tender inner ones. Rinse and cut in two. Bring 4-5 quarts of water to boil, put in the cauliflower, and cook it till tender, about 25-30 minutes. Prod it with a fork to test for doneness. Remove from the water and set aside. When cooled, chop the cauliflower into pieces not bigger than a small nut. Return the water to the stove, bring to boil, and add the pasta and cook until done. While the pasta is cooking, put the oil and garlic in a medium saute pan, turn the heat to medium, and cook until the garlic becomes colored a light, golden brown. Then add the chopped anchovies and cook for a few minutes while stirring an mashing the anchovies against the sides of the pan with a wooden spoon until they are close to the consistency of a paste. Add the cauliflower pieces and turn them until thoroughly coated with the oil, mashing some with the back of the spoon. Toss the sauce with the cooked and drained pasta. Add the chopped parsley, toss, check and adjust seasoning, then serve immediately. I wasn't sure I was going to like this, but I did. It was a very nice combination of flavors. If you are looking for an alternative to tomato or pesto based sauces, this is a really nice alternative. It is a very interesting and rich mixture, I prepare and I can recommend it.